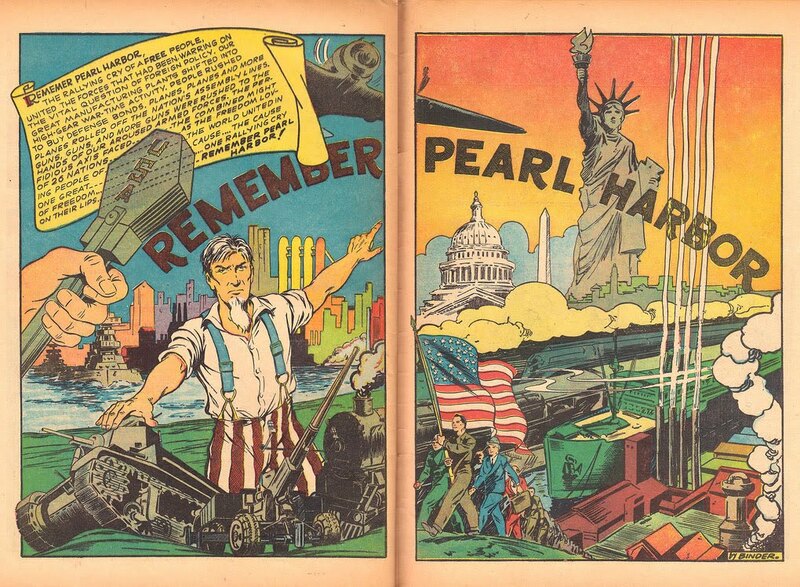 On this day, pretty much every year, somebody trots out the cover to Street & Smith's 1942 comic Remember Pearl Harbor to help commemorate the day in 1941 when Pearl Harbor was bombed. 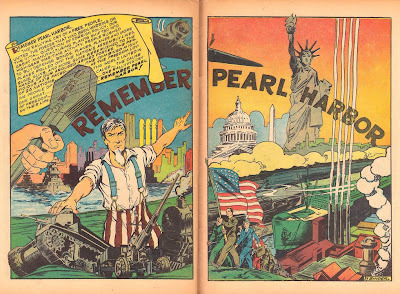 Sometimes, it's accompanied by some basic information, like that it was drawn by Jack Binder and was released in early 1942 as the first comic book to acknowledge the bombing in any capacity. By all accounts I've read (not having been able to read the actual comic myself) the story not surprisingly portrays the Japanese in a relatively poor light, and pretty blatantly plays into American nationalism. 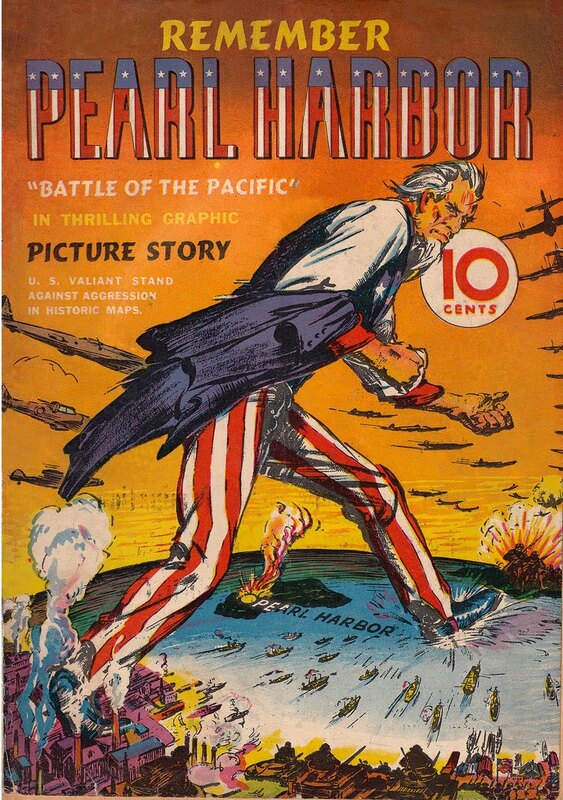 Even the most subtle imagery -- the huge mortar cannon coming out of Uncle Sam's crotch -- is barely less than glaring. It's difficult to argue that the book is NOT jingoistic. If you've read any comics from the early 1940s, you've almsot undoubtably stumbled across similar expressions of nationalism. Whether it was obvious caricatures of Adolf Hitler and Joseph Stalin; or yellow-faced, buck-toothed Japanese villains; or Superman filming the atomic bomb being dropped on Hiroshima. It was beyond just American pride, it was almost a reveling in utterly defeating the bad guys. It wasn't sufficient to overpower their military, but there was a sense that they needed to be humiliated and ground into the dirt. It's unclear to me if that's how U.S. citizens, by and large, actually felt. I know, in my readings about the infamous Keafauver Hearings and associated boycotts of the comic industry, that, while there were indeed people acting on the far side of irrationality and organizing comic book bonfires and the like, that wasn't exactly the norm either and a number of people in fact maintained a fair degree of rational behavior despite their concerns as parents. 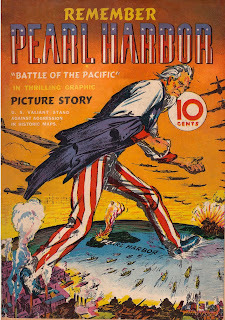 That leads me to wonder just how much the media outlets of the 1940s were distorting American's view -- both with regards to portraying an outrage that might be misdirected or exaggerated, as well as how that portrayal then impacting others' thinking. There're obvious parallels to today. Characters like Glenn Beck are showing an upset and anger that isn't actually representative of the American public. But by claiming that he is completely typical in that regard has suggested to others that it's perfectly acceptable to amp up their own negative emotions and direct them inappropriately. Now, admittedly, Hitler exterminating tens of thousands of people in concentration camps is outrageous even compared to 9/11 so more outrage there is understandable. But was it really so deeply visceral and unfocused? Where everything that was remotely unAmerican was considered better off destroyed? Or is that just how it got translated in comic books and movies of the time? I'm asking that sincerely; I don't know. It's almost every day that I see some news item that makes me shake my head in disgust about how people never learn, and we're almost destined to annihilate our planet in hubris-filled myopia. But every now and then, I come across some anti-intellectual pop culture pap made decades ago that actually makes today's issue seem not quite so bad.